Strut towers are designed mainly to handle the vertical forces imposed by the struts (AKA "shocks"), and on the Stealth and 3000GT, they are particularly solid. But although the towers are adequate to handle normal horizontal forces, the stresses of racing (or even repeated travel over rough roads) will eventually weaken them. A strut tower bar connects the two strut towers, enabling them to share in any such horizontal stresses. In addition to extending the life of the towers, the benefit that's most important to those of us who race is the more controlled handling that a tower brace provides. On the recommendation of Eric Bowden of 3SX Performance, I went with the beefier (crafted from 6061-T6 aluminum), more expensive strut bar offered by TEC Performance, as opposed to 3SX Performance's own strut tower bar. There is a complete page on the TEC site detailing the installation of their strut tower bar on a Stealth or 3000GT DOHC model, with ECS. (You can also find a link to a strut tower stress theory discussion there). 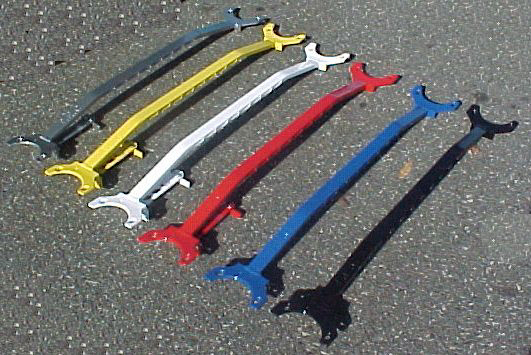 TEC offers the bars in six colors, as shown below, as well as chrome (not shown). Since I have an SOHC, and the installation is different, here are my instructions for how to install a front strut tower bar on the Base model Stealth and (97+) Base model 3000GT. 7/16" Socket, 11/32" Socket for 1/4" Ratchet, above. Extension and swivel for 1/4" Ratchet, above. Fender blanket or heavy towel to protect your car. 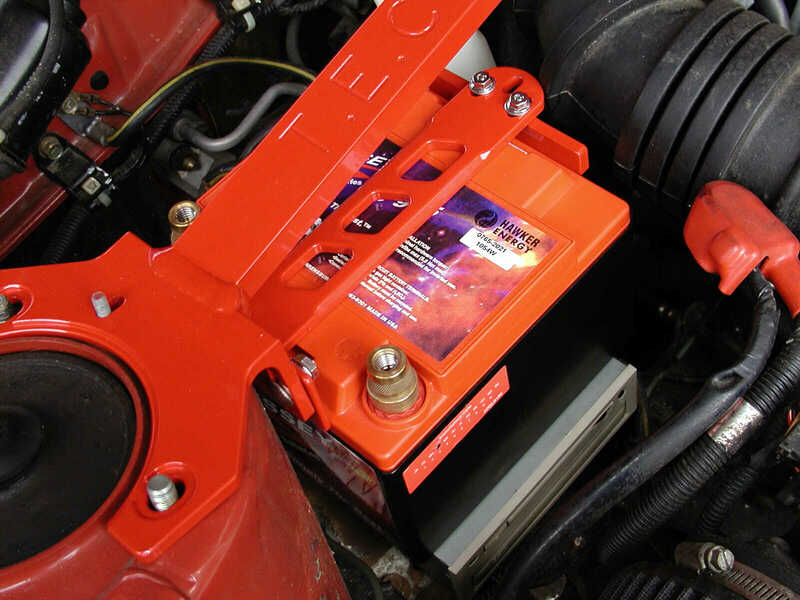 The only prep you will really have to do is to select a replacement battery that is small enough to fit under the tie-down bracket that comes with the TEC Front Strut Tower Bar. 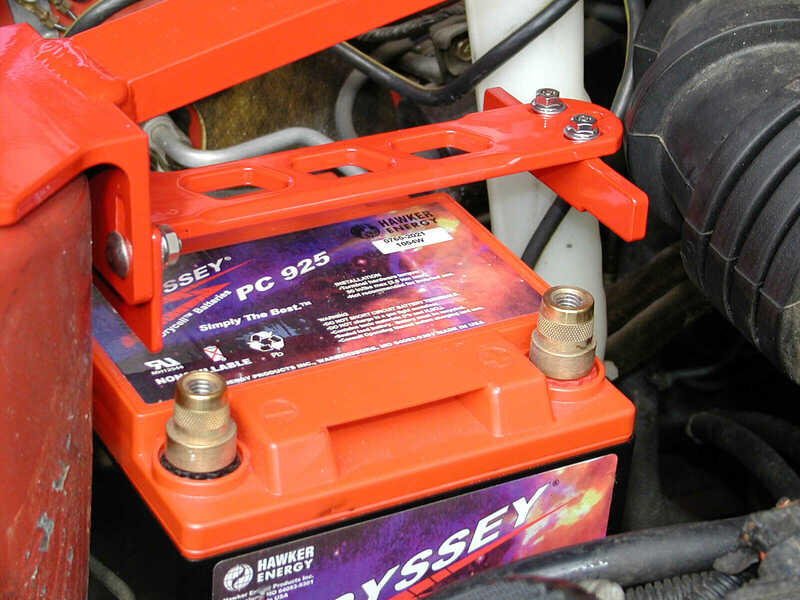 Choose a battery with maximum dimensions (not including the terminals) of 6.75"H x 6.813"W x 9.75"L.
Depending on the height of the battery, you may have to fashion some kind of platform on which to place the battery, to bring it up to the proper height to be held securely by the bracket. Do the math and figure it out in advance. Click HERE for a printable version of the image above. 1. 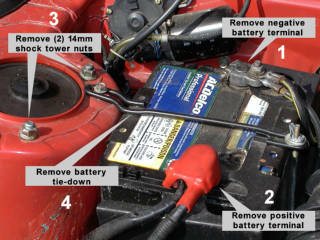 Remove the negative battery terminal. 2. 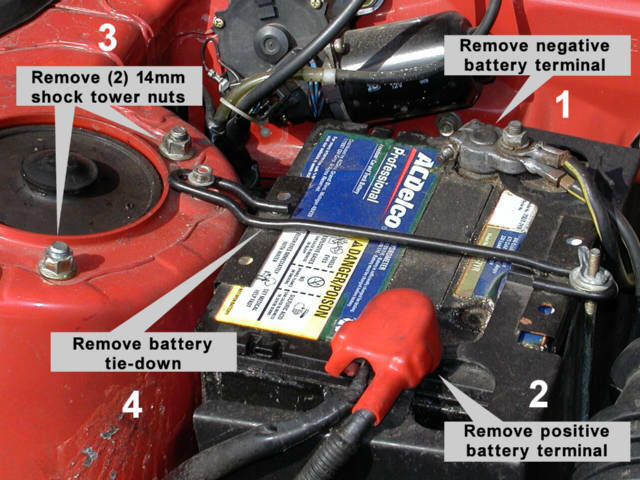 Remove the positive battery terminal. 3. Remove the two 14mm nuts from the side of the shock tower closest to the engine bay. Similarly, remove the equivalent two 14mm nuts from the other shock tower. 4. Remove the battery tie-down. This part will be relegated to your "stock parts" bin, to save in case you ever want to return the car to stock condition. 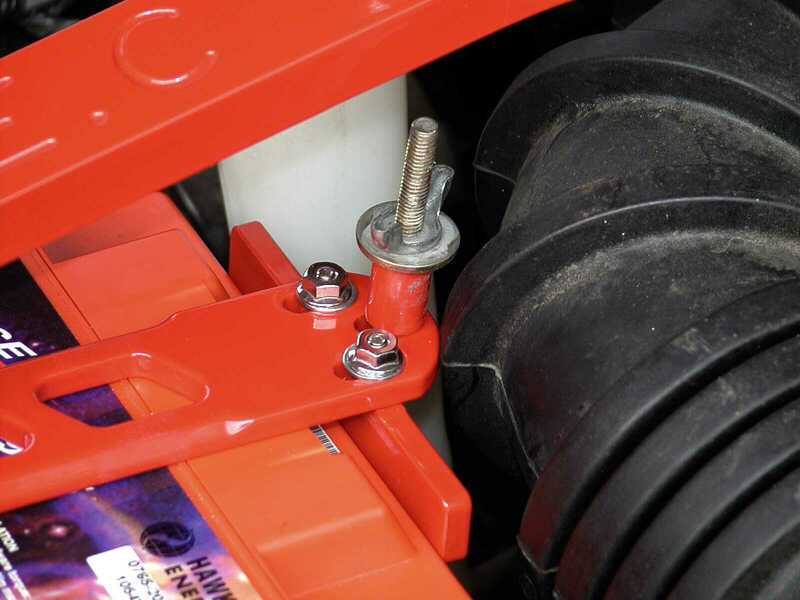 Keep either the 10mm nut (or the J-bolt wingnut) from the tie-down handy, since you will be re-using it. 5. Remove the old battery and replace it with a smaller one, as per the size restrictions above. If your calculations suggest that it's necessary, place the platform you've chosen beneath the battery. 6. Remove the spacer which is taped to the battery hold down. Loosen the adjuster plate at the end of the bracket. The main bracket (pictured) should be attached loosely with the supplied carriage bolts, washers, and flange nuts. Attach the J-bolt loosely to the middle slotted hole on the end of the battery bracket. Use the 10mm nut (or wingnut) and supplied spacer to hold the J-bolt in place. Place the end of the strut bar over the 14mm bolts on the shock tower - first the passenger side, then the driver's side. 7. And here is the battery, all snug in it's bracket. The 1" x 3/8" (color-coordinated!) spacer has been placed on the J-bolt; this spacer is necessary, since the threads end just below the wingnut. 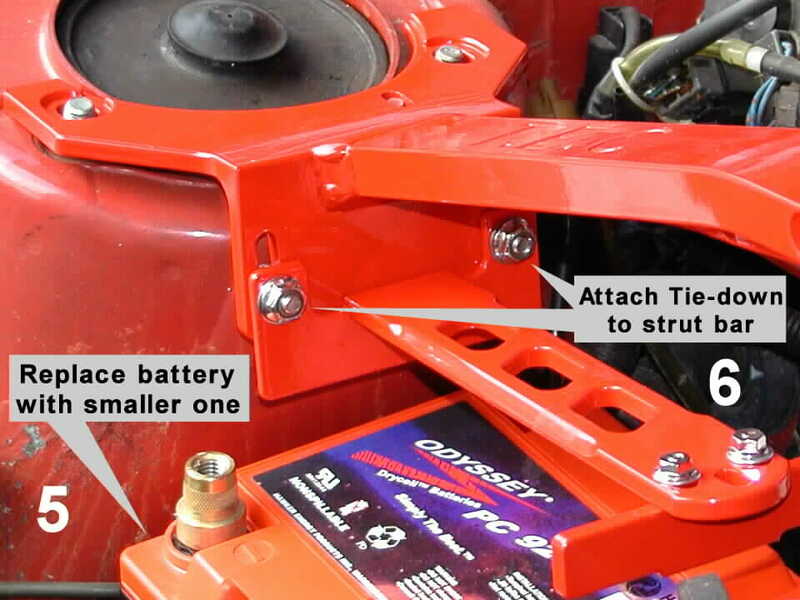 Please note that all bracket fasteners should be only just barely hand-tight until the strut bar is fully tightened. Check the strut bar to make sure it's centered, then alternately torque the four 14mm nuts to 33lbs. Now you may tighten all the battery hold-down bracket fasteners the rest of the way. As soon as I placed the new battery, an Odyssey 925, on the battery platform, I realized that I had a bit of a problem... I had used the specs from the wrong battery (on their website), and was off by a full inch in my height calculations! I had intended to use the platform tray from my previous battery, which was only 5/8" high, and I didn't want to be using two trays - now I had to find a single platform that was about 1 5/8" thick. All I could find around the house was a piece of 2 x 6 lumber (which is only 1.5" thick), and the car was apart, so I couldn't even drive to pick something up... Then I spied an old computer internal CD drive that was earmarked for the trash, which when I measured it, proved to be 1 5/8" thick. Voila! It brought an appreciative chuckle from the inspector when I got my emissions test done today, and it proved to be the ideal battery platform (and not flammable like the piece of 2 x 6 lumber). It was a lucky find, and it works just great! Here you can see the huge space above the battery..., before I placed it on a platform. You can see the CD drive beneath the battery. It's a pretty neat support! Here's a photo of the completed installation. Now that wasn't too hard, was it? If you've followed this guide exactly, (well..., without duplicating my miscalculation, hopefully), you have probably just completed the whole installation in under an half-hour. Your car is safer, stronger, and will handle better during extreme steering maneuvers. And you have the satisfaction of knowing that it was done right. You undoubtedly saved about $100 in labor charges, too! The TEC Performance Front Strut Tower Bar is every bit as solid as they claim. It is well-made, impeccably finished in a thick powdercoating, and is incredibly easy to install, even by someone with only minimal skills. The improvement in high-speed handling is substantial. Cornering is smoother, with less "dip" in the hardest turns. Body-flex is reduced significantly, as well. Previously, when I would enter a raised driveway, for example, or go up on a berm during racing, you could actually hear the car "creak" a bit, as the entire frame twisted slightly. By coupling the front towers, a more rigid engine "cage" is created apparently. The car definitely feels more solid. Article & Images ©1995-2004 Bob Forrest, All Rights Reserved.